The Tule groundwater sub-basin is an agriculturally-intensive area located in the eastern-central part of the southern San Joaquin Valley, California. Urban and agricultural stakeholders in the Tule sub-basin depend on a combination of imported surface water and pumped groundwater to meet their water de- mands. The water service districts there receive surface water deliveries from the Friant Unit of the Central Valley Project (CVP) (United States Bureau of Reclamation), the State Water Project (SWP) (California Department of Water Resources), the Kings River (United States Army Corps of Engineers), or the Success Reservoir (United States Army Corps of Engineers). All of these surface water sources develop their supplies from run-off and snow melt in the foothills and watersheds of the Sierra Nevada mountain range. The state of California is prone to recurring droughts, some lasting several years. During drought periods, irrigated agriculture depends more heavily on groundwater pumping as surface water supplies are generally less available. To buffer the effects of drought, districts in the Tule sub-basin have cooperatively managed their surface water and groundwater resources conjunctively. During a normal to wet year, excess available surface water supplies (e.g. releases for flood control) are used by some districts to recharge their groundwater reservoirs. However, a prolonged multi-year drought invariably leads to an increased dependence on groundwater pumping and overdraft of the groundwater sub-basin storage. In addition to climate variability, changes in future surface water supplies may also occur due to the passage of the Central Valley Project Improvement Act of 1992, which mandates that 400,000 acre-feet per year of CVP water be released from the Friant Unit into the San Joaquin River for restoration purposes. 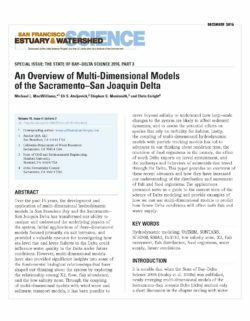 To better understand the impacts of irrigated agriculture, fluctuating surface water supplies, and groundwater pumping practices on water levels and groundwater storage in the Tule sub-basin area, we developed a GIS-based con- junctive use model to study them. The study area is 541,580 acres in size and contains the entire Tule groundwater sub-basin and parts of the Kaweah and Tulare Lake groundwater sub-basins. The incorporated land in the study area is divided into 26 water service districts: 21 irrigation, water, or public utility districts; 2 major cities; 2 private contractors; and 1 water company. These districts are either completely or partially located within the study area. The study area is further delineated into 9,114 individual land units from a 1985 land use survey of Tulare County. Agriculture is the largest land use, compris- ing 72% of the study area. Native and urban land use comprise 22% and 4% of the study area, respectively. Semi-agricultural and special conditions (i.e. fallow) land use each comprise 1%. Twelve crops account for 95% of the area under agricultural production. Cotton, grain & grass hay, citrus, vineyards, and alfalfa individually represent 20.3, 18.6, 13.6, 13, and 10.3% of the total productive acreage, respectively. Surface water supplies are distributed to the districts and ultimately to the individual land units by a surface water supply system. The surface water supply system in the model is divided into two parts: 1) an inter-district surface water channel network, and 2) an intra-district surface water distribution system. The inter-district channel network consists of the explicitly modeled source and diversion channels which import surface water into the study area and deliver it to individual districts. The intra-district distribution system con- sists of the implicitly modeled district channels (e.g. laterals, ditches, canals, farm turnouts) which deliver surface water to individual land units within each district. The conjunctive use model consists of three loosely-coupled sub-models: 1) a surface water supply (SWS) model, 2) an unsaturated zone water budget (UZWB) model, and 3) a groundwater flow model. The base period of the study covers the fiscal water years of 1970-99. The purpose of the SWS model is to calculate the surface water balance for the source and diversion channels in the inter-district channel network. For each modeled surface water channel, the SWS model computes surface water deliveries from it to each district and conveyance losses from it due to evaporation and channel seepage. The primary model outputs are monthly surface water deliveries to each district and monthly seepage rates from modeled channels. The surface water deliveries became input for the UZWB model. The channel seepage became input for the groundwater flow model as localized aquifer recharge. The allocation of surface water within each district, via the implicitly modeled intra-district surface water distribution system, is estimated by the UZWB model. The total imported surface water for 1970-99 from the CVP and the Success Reservoir are 13,329,262 and 4,653,501 acre-feet (af), respectively. The SWP and the Kings River imported the lesser amounts of 88,625 and 7,332 af, respec- tively. Annual CVP diversions varied from 125,970 af in 1977 to 679,298 af in 1993 with a 30-year annual average of 444,309 af. The Tule River and Pioneer Ditch both receive regulated releases from Success Reservoir. Tule River annual imports varied from 11,034 af in 1977 to 607,154 af in 1983 while the Pioneer Ditch varied from 3,445 af in 1973 to 5,874 af in 1990. The total natural runoff from the Deer Creek and White River from 1970-99 were 703,444 and 219,098 af, respectively. Deer Creek runoff varied from 4,082 af in 1992 to 103,716 af in 1983 while the White River runoff varied from 422 af in 1977 to 37,985 af in 1998. From 1970-99, a total of 15 million af of surface water was applied by the service districts in the study area. The applied surface water varied from a low of 135,482 af in 1977 to a high of 708,293 af in 1996. The Lower Tule River Ir- rigation District and the Delano-Earlimart Irrigation District together account for 59% of the total applied surface water while occupying approximately 40% of the incorporated area in the study area. Over the 30-year base period, an estimated total of 3.5 million af of seepage conveyance loss occurred in all sur- face water channels. Seepage in the Tule River, Deer Creek, and White River accounted for 85% of the total seepage. Total annual seepage varied from a low of 8,128 af in 1977 to 467,084 af in 1983. The UZWB model then calculates the monthly water storage changes in the soil root zone and deep vadose zone of each land unit, where the land unit is the UZWB model scale of resolution. It also models the intra-district surface water distribution system by estimating the monthly allocation of surface water to individual land units within each district. The main model outputs were the recharge to the unconfined aquifer from surface applied water and precipitation, and the groundwater pumping demand from the unconfined and confined aquifers. The recharge and groundwater pumping rates became input for the groundwater flow model. The total annual agricultural and urban consumptive use ranged from 865,800 af in 1970 to 1,246,700 af in 1999. The estimated total pumping ranged from 148,100 af in 1978 to 570,000 af in 1990. As expected, pumping was heaviest during the droughts of 1975-77 and 1987-92, and lightest during the wet years of 1973, 1978, 1982-83, 1995, and 1998. Precipitation totals varied from 177,800 af in 1990 to 974,400 af in 1998. Diffuse recharge from surface applied water ranged from 64,800 af in 1992 to 350,100 af in 1983. The net aquifer recharge for the entire study area was computed by ag- gregating the aquifer recharge and groundwater pumping of each land unit to this scale and adding the contribution to aquifer recharge from channel seepage. The monthly net recharge was then summed to produce a cumulative annual net recharge from 1970 to each fiscal water year from 1971-99. The water balance computed for the entire study area neglects horizontal groundwater inflows and outflows through its vertical boundaries. Groundwater fluxes undoubtedly exist along these boundaries. However, net fluxes are likely small in comparison to the total changes in storage due to vertical stresses applied to the entire study area (e.g. groundwater pumping, evapotranspiration, applied surface water, channel seepage). Horizontal groundwater flow on the inter-land unit and inter-district scales is expected to be more significant. For computing a total water balance, however, we made the simplifying assumption that the study area behaves as a relatively closed system where the net horizontal groundwater inflows through its vertical boundaries are small. Invoking this assumption, we then use the cumulative net recharge as an estimate of the cumulative groundwater storage change in the aquifer system. Ideally, verification of these estimates is performed by comparing them with an objective measure of the study area aquifer storage changes. However, changes in groundwater storage are not directly observable and must always be estimated using non-direct measures. As such, an objec- tive measure for verification does not exist. As an alternative, we compare the water balance model results with those produced by the water-table fluctuation (WTF) method. 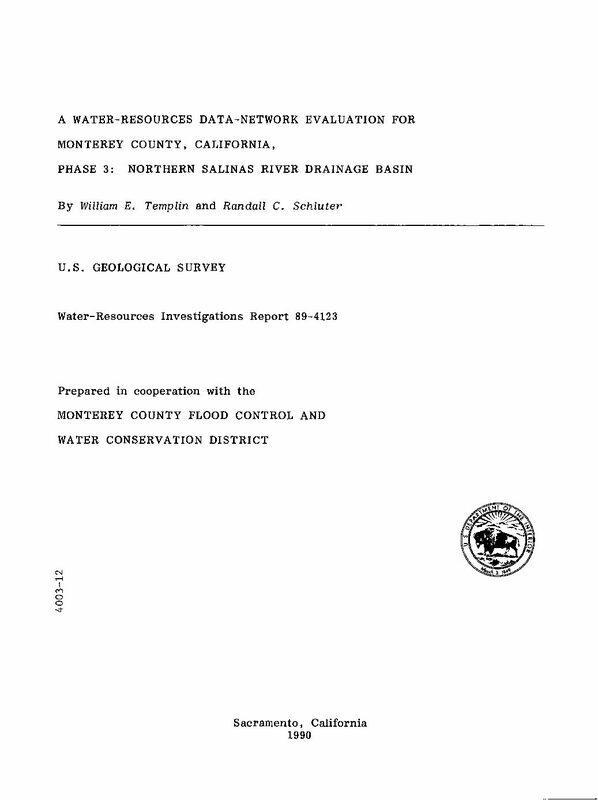 The trends in cumulative annual groundwater storage changes computed from the water balance and the WTF method from 1970-99 were quite similar. The minimum and maximum differences between them were 2,450 af (1980) and 752,387 af (1991), respectively. From 1970, the maximum amount of ground- water accumulation occurred in the spring of 1987 with the WTF method and the water balance estimating positive storage changes of 1,146,286 and 898,128 af, respectively. 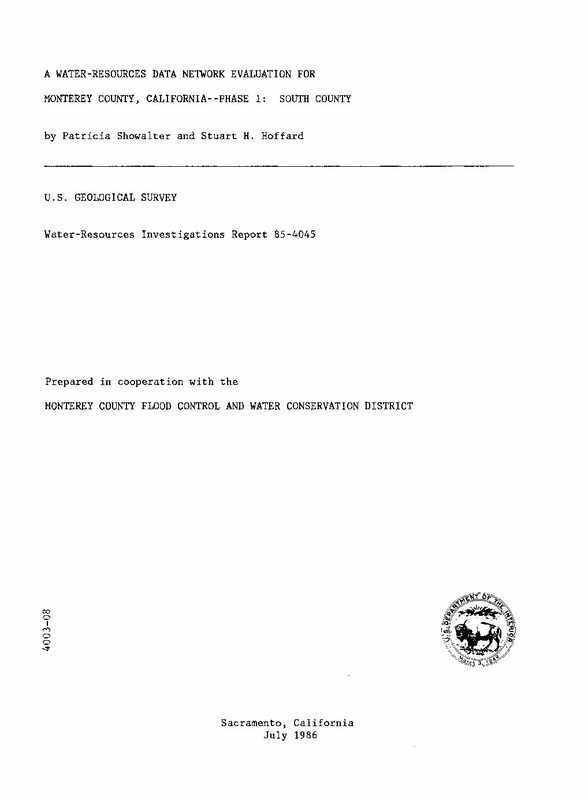 The maximum groundwater overdraft occurred in 1993 with the WTF method and the water balance estimating negative storage changes of 1,610,210 and 1,218,566 af, respectively. The 1987 and 1993 fiscal water years marked the beginning and ending of a major 6-year drought in California, respectively. Finally, the groundwater flow model calculates the changes in water levels in the aquifer system subject to transient groundwater recharge and pump- ing stresses. A post-processing routine calculates the cumulative groundwater storage changes over each district and the entire study area for each stress pe- riod. An automated calibration of the groundwater flow model was performed to refine the conceptual model of the hydrogeology and to estimate the spa- tial distributions of the aquifer system horizontal hydraulic conductivity. The calibration period of the groundwater flow model is 1970-85 and the validation period is 1986-99. Three different conceptual models of the aquifer system horizontal hydraulic conductivity, Kh, structure were evaluated in the calibration process: 1) Khas an exponential function of the specific yield, Sy, distribution, 2) Kh as a linear function of the saturated hydraulic conductivity of the soil survey map- ping units, and 3) division of the model domain into square zones of uniform size. The models were calibrated against both spatially distributed hydraulic head targets and cumulative groundwater storage change targets for seven of the largest districts. The discretization of the model domain into uniform square zones provided the most robust Kh structure and produced the most reason- able estimates of hydraulic head and district groundwater storage changes from the three conceptual models over the 1971-85 calibration period. The calibrated model was then used to compute the annual net inter-district groundwater fluxes between adjacent districts. In general, groundwater flux directions were con- sistent with the large-scale hydraulic gradients. Annual inter-district net fluxes between adjacent districts ranged from negligibly small ( < 100 af) to as much as 80,000 af (e.g. net flux from Lower Tule River ID to Pixley ID). Net inter-district fluxes were generally a function of the local transmissivity, the length of the shared border between adjacent districts, and the differences in their surface water supplies. 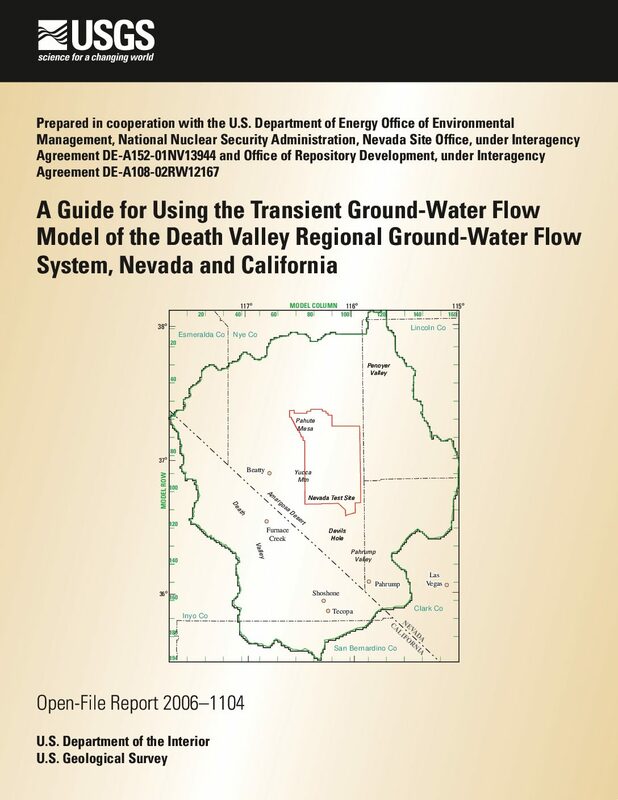 This report is a guide for executing numerical simulations with the transient ground-water flow model of the Death Valley regional ground-water flow system, Nevada and California using the U.S. Geological Survey modular finite-difference ground-water flow model, MODFLOW-2000. Model inputs, including observations of hydraulic head, discharge, and boundary flows, are summarized. Modification of the DVRFS transient ground-water model is discussed for two common uses of the Death Valley regional ground-water flow system model: predictive pumping scenarios that extend beyond the end of the model simulation period (1998), and model simulations with only steady-state conditions. Intense demand forwater in the Central Valley of California and related increases in groundwater nitrate concentration threaten the sustainability of the groundwater resource. To assess contamination risk in the region, we developed a hybrid, non-linear, machine learning model within a statistical learning framework to predict nitrate contamination of groundwater to depths of approximately 500m below ground surface. 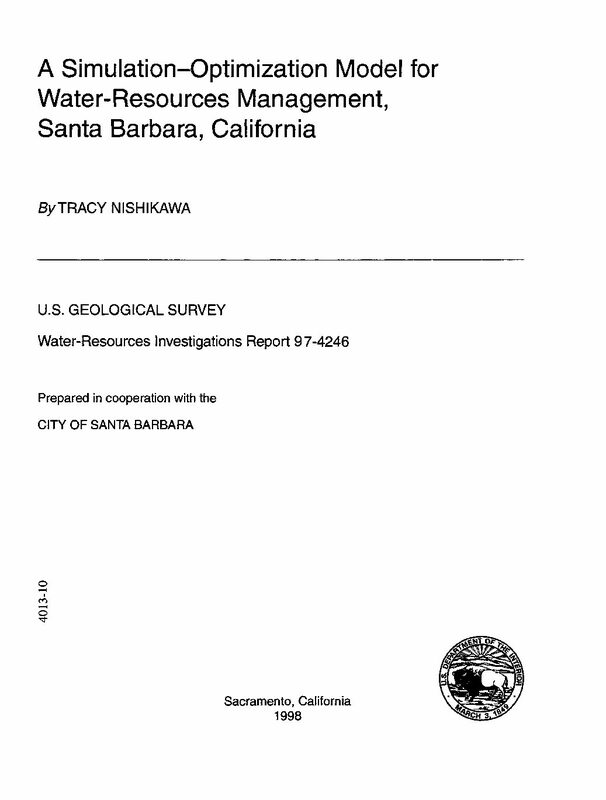 A database of 145 predictor variables representing well characteristics, historical and current field and landscape-scale nitrogen mass balances, historical and current land use, oxidation/reduction conditions, groundwater flow, climate, soil characteristics, depth to groundwater, and groundwater age were assigned to over 6000 private supply and public supply wells measured previously for nitrate and located throughout the study area. The boosted regression tree (BRT) method was used to screen and rank variables to predict nitrate concentration at the depths of domestic and public well supplies. 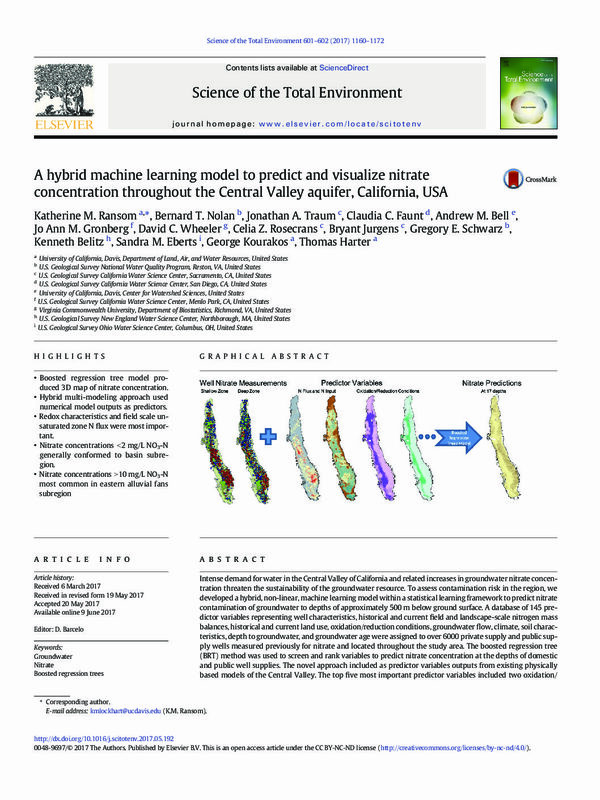 The novel approach included as predictor variables outputs from existing physically based models of the Central Valley. The top five most important predictor variables included two oxidation/reduction variables (probability of manganese concentration to exceed 50 ppb and probability of dissolved oxygen concentration to be below 0.5 ppm), field-scale adjusted unsaturated zone nitrogen input for the 1975 time period, average difference between precipitation and evapotranspiration during the years 1971–2000, and 1992 total landscape nitrogen input. Twenty-five variables were selected for the final model for log-transformed nitrate. In general, increasing probability of anoxic conditions and increasing precipitation relative to potential evapotranspiration had a corresponding decrease in nitrate concentration predictions. Conversely, increasing 1975 unsaturated zone nitrogen leaching flux and 1992 total landscape nitrogen input had an increasing relative impact on nitrate predictions. Three-dimensional visualization indicates that nitrate predictions depend on the probability of anoxic conditions and other factors, and that nitrate predictions generally decreased with increasing groundwater age. The addition of water on or below the earth’s surface generates changes in stress that can trigger both stable and unstable sliding of landslides and faults. 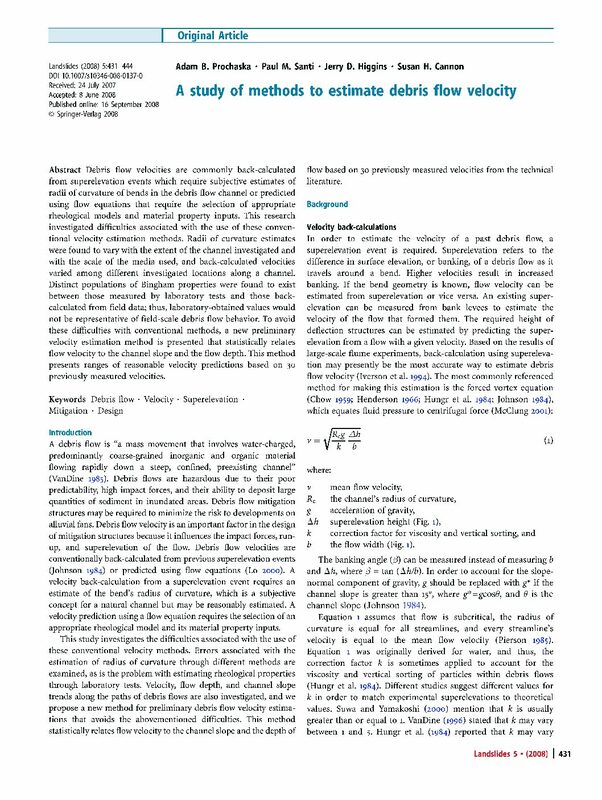 While these sliding behaviours are well-described by commonly used mechanical models developed from laboratory testing (e.g., critical-state soilmechanics and rate-and-state friction), less is known about the field-scale environmental conditions orkinematic behaviours that occur during the transition from stable to unstable sliding. Here we use radarinterferometry (InSAR) and a simple 1D hydrological model to characterize 8 years of stable sliding of the Mud Creek landslide, California, UsA, prior to its rapid acceleration and catastrophic failure on May 20, 2017. 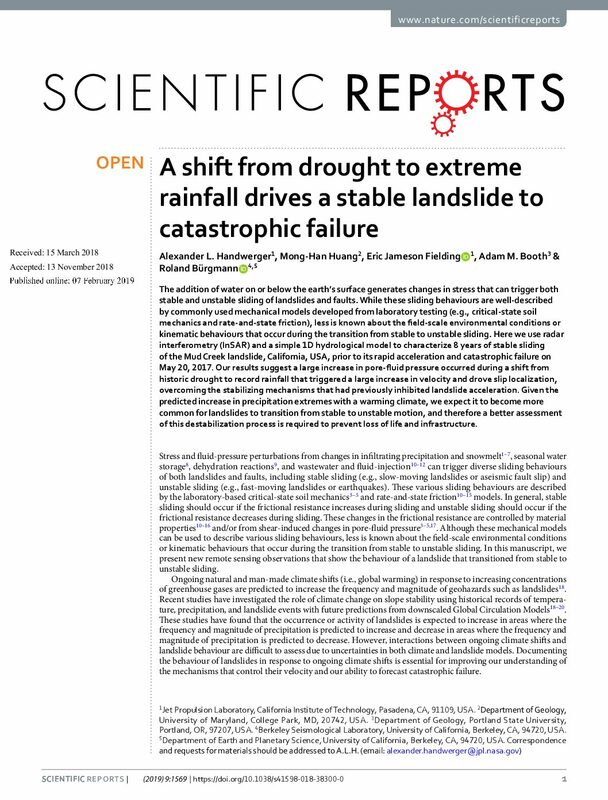 Our results suggest a large increase in pore-fluid pressure occurred during a shift from historic drought to record rainfall that triggered a large increase in velocity and drove slip localization, overcoming the stabilizing mechanisms that had previously inhibited landslide acceleration. Given thepredicted increase in precipitation extremes with a warming climate, we expect it to become more common for landslides to transition from stable to unstable motion, and therefore a better assessmentof this destabilization process is required to prevent loss of life and infrastructure. A simulation-optimization model has been developed for the optimal management of the city of Santa Barbara's water resources during a drought. The model, which links ground-water simulation with linear programming, has a planning horizon of 5 years. The objective is to minimize the cost of water supply subject to: water demand constraints, hydraulic head constraints to control seawater intrusion, and water capacity constraints. The decision variables are monthly water deliveries from surface water and ground water. The state variables are hydraulic heads. The drought of 1947–51 is the city's worst drought on record, and simulated surface-water supplies for this period were used as a basis for testing optimal management of current water resources under drought conditions. The simulation-optimization model was applied using three reservoir operation rules. In addition, the model's sensitivity to demand, carryover [the storage of water in one year for use in a later year(s)], head constraints, and capacity constraints was tested. Understanding California’s water balance sheet—how much there is, who has claims to it, and what is actually being “spent”—is key to effectively managing the state’s limited water supply in support of a healthy economy and environment. The latest drought has spotlighted serious gaps and fragmentation in California’s water accounting system. In this report, we identify gaps in California’s water information systems. 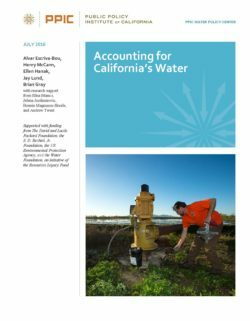 We recommend that the state adopt an overarching goal of modernizing its water accounting, and that key state agencies—supported by an oversight committee of key stakeholders and independent experts—develop and adopt a common accounting framework. We outline a dozen priority actions to strengthen water accounting by: improving measurements and estimates of water availability and use; firming up legal claims on water rights and water reserved for the environment; establishing protocols, standards, and models for transparent water accounting at all levels across the state; and making water information more available and accessible to water managers, water users, policymakers, and the public.